Each year there are multiple mass gatherings which could conceivably facilitate disease transmission; including the Super bowl, Mardi Gras, Ramadan, and Carnival in Rio - and the biggest of them all – the Hajj. Epidemiologists also watch Chunyun, or the Spring Festival Travel Season (of which Chinese New Years is a central part) with particular interest, as it is rightfully billed as the largest annual migration of humans on the planet. Chunyun begins about 15 days before the Lunar New Year and runs for about 40 days total (see Health Vigilance For The Chinese New Years) and during which time more than 2 billion passenger journeys will be made (mostly via crowded rail and bus) across Asia. 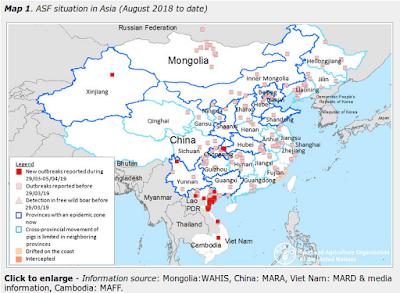 While mass gatherings and holiday travel events like Chunyun certainly provide greater opportunities for disease outbreaks, history has shown that major epidemic outbreaks have been a rarity (for an exception, see The Impact Of Mass Gatherings & Travel On Flu Epidemics). Still, public health authorities must anticipate and prepare for the worst (see How The ECDC Will Spend Your Summer Vacation). While later in the year all eyes will be on the Hajj in Saudi Arabia, right now the more immediate concern is the FIFA World Cup which will be held in Brazil between June 12th and July 13th. This event is held every four years, and will draw soccer fans from all over the world to the twelve host cities. The CDC updated their travel notice earlier this week (Watch - Level 1, Practice Usual Precautions), with advice on vaccines, medicines to take, and even security and safety information while traveling. Today the ECDC has released a 16-page PDF risk assessment on the World Cup, which not only includes illnesses or infections that may be acquired while in Brazil, but also infections that may be imported into Brazil by international travelers. In April of this year the American Society for Microbiology published a press release warning that upcoming FIFA World Cup in Brazil, along with the presence of two very competent vectors (Aedes Aegypti & Aedes Albopictus mosquitoes) could help put the Chikungunya virus on a fast track to spreading across the Americas (see Study: Chikungunya’s Growing Threat To The Americas). Over the last years, Brazil has managed to eliminate many infections like measles and rubella, which are still endemic in many other countries and could be imported to Brazil by international visitors . one disease which could be re-introduced to Brazil: cholera. EU citizens visiting the 2014 World Cup in Brazil will be most at risk of gastrointestinal illness and vector-borne infections. Therefore, they should pay attention to standard hygienic measures to reduce the risk of gastrointestinal illness and protect themselves against mosquito and other insect bites using insect repellent and/or wearing long-sleeved shirts and trousers in regions where vector-borne diseases are endemic. Malaria chemoprophylaxis if planning to travel to areas at risk for malaria transmission. Vaccination for influenza (preferably with the 2014 southern hemisphere seasonal vaccine) because the event takes place at the peak of the influenza season in the southern and south-eastern regions of Brazil. All other vaccinations recommended by health authorities in Brazil, in particular hepatitis A and all vaccinations included in the immunisation schedule of EU Member States. EU travellers to the Brazil 2014 World Cup tournament should avoid sexual risk behaviours to decrease the risk of sexually transmitted infections, blood-borne infections, and HIV. If healthcare is needed, travellers should contact Brazil's healthcare system (Sistema Único de Saúde – SUS) through local hospitals or use their private health insurance at any healthcare provider . Travellers who require hospitalisation in the EU after having been hospitalised in Brazil should report their previous hospitalisation in order to accelerate the possible ascertainment of recent healthcare-associated infections. EU travellers to Brazil, and particularly to the large metropolitan areas of Rio de Janeiro and Sao Paulo, should exercise caution, pay close attention to their personal security, and monitor the media for events that may affect their safety. Surveillance for communicable diseases should be sensitive enough to detect threats at a stage when interventions are likely to prevent or reduce the impact of outbreaks. There is a possibility that returning travellers will export communicable diseases, for example vector-borne diseases such as dengue, and introduce them to their country of residence. There are a number of diseases and infections that are highly unlikely to occur during the 2014 Brazil World Cup, but are still important to get monitored because of their severity and high case-fatality ratio. These include viral haemorrhagic fevers and diseases that could result from intentional release, such as anthrax, plague and smallpox. Outbreaks and spread of vaccine-preventable diseases are of particular concern during mass gatherings but there are no indications that the risk is higher than usual.